How do we teach wisdom to children? How do we teach the moral and ethical values that will enable them to discern, distinguish and evaluate, and ultimately make the decisions that will serve them in their lives? Children are most likely to discover and understand when all their senses are engaged in the learning experience. This book provides an invaluable collection of life lessons in the form of games and activities which can be taught in a fun, easy and, most importantly, memorable way. Each of the 50 activities is easy to set up and will develop children's values and self-esteem, providing valuable life skills. Each one has a list of simple equipment and full instructions, together with an explanation of the life lesson and a suggestion for a more advanced activity to further develop the skill. There are activities for children aged 6 to 10. 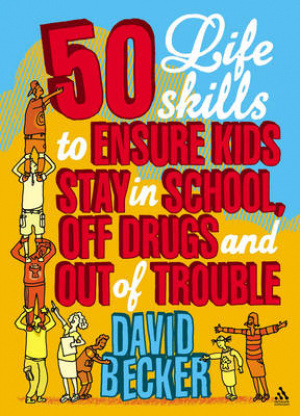 50 Life Skills to Ensure Kids Stay in School, Off Drugs and Out of Trouble by David Becker was published by Bloomsbury Publishing Plc in August 2008 and is our 51992nd best seller. The ISBN for 50 Life Skills to Ensure Kids Stay in School, Off Drugs and Out of Trouble is 9781855394612. Be the first to review 50 Life Skills to Ensure Kids Stay in School, Off Drugs and Out of Trouble! Got a question? No problem! Just click here to ask us about 50 Life Skills to Ensure Kids Stay in School, Off Drugs and Out of Trouble.